The best, easiest way to the main gate is Exit 77 from I-95, toward Edgewood. This is Rt24, and will take you directly to the main gate, which is open 24/7. If planning to stay overnight, it is recommended to call ahead to determine availability of a site and to get registration information. Plan to arrive well before dark in order to find the campground. Attempted to make reservations and was told I need to go online, print and sign their policy and email it to them prior to making reservations. I asked if I could do it there and was told no. So much for supporting those that travel for a night or two. Do they realize we are often in RVs? I have never experienced a dumber policy and have stayed in famcamps coast to coast. Pure silliness. This is no longer an RV site. Outdoor & Rec say that there are only 10 Tent sites with no hookups and a portable potty. As in the previous review, the campground is isolated on a base with little or no facilities. This is the old Edgewood Arsenal, the main base is Aberdeen Proving Ground, about 30 miles north. There is 50amp service available, but you will need extension cords. The power poles are at the front of the sites, and are shared. At the time of my visit, the park was empty. And very, very quiet. Except when they test explosives. Facilities consist of a playground, a porta-potty, and a dumpster. Enjoy. The best, easiest way to the main gate is Exit 77 from I-95, toward Edgewood. This is Rt24, and will take you directly to the main gate, which is open 24/7. Other gates have restricted hours and/or size limits. Could be a good location, right on the Bush River, with crabbing and fishing, and a fairly large wooded area for hiking. Make your own trails as you go. We did not actually stay here but we did drive through it today. We were looking for a place to stay when we visit our grandkids who live nearby. The campground has 5 sites with electric and 1 RV site without electric. There also appeared to be 2 tent sites. The campground is located on the water at the end of a road that is overgrown with untrimmed trees. It is behind a section of abandoned base housing. The housing area appeared to have been abandoned for years - there was one home with a large tree that had fallen on the house. There were RV's in each of the six sites and all looked to have been there for a while. As noted by other earlier reviews, they have cobbled together an impressive system of water hoses. I called the MWR office and was told that there may be an opening sometime in June but it didn't sound very likely. The MWR rep did indicate that she had heard of plans to build another campground with water, electric and sewer hook-ups. The rep indicated that the new campground would be located in another area - somewhere in the main part of Aberdeen Proving Grounds and not the Edgewood area where the current campground is located. The rep had no information about who to contact with questions regarding the new campground. The rep also had no information about When, Where and how many sites were being considered. It's a great value, because it was free! They never got around to charging the credit card, but then the one person who does reservations never really answers the phone anyway. When I finally got through, I made a reservation for the last available site, one of 6. I think it was available because it didn't actually have an electrical hookup. So we pulled up to the pavilion and parked there for the night. The other 5 sites are taken up by what appear to be long term or permanent RV set-ups, who have creatively strung hoses and wires to each site. I don't know how they are allowed to do this, since there is no dump station at the sight. We found plenty of evidence of sewage tank dumping on the grass, as there are little piles of toilet paper around. There is a nice boat launch with a little sandy beach. However, I was reluctant to let the kids play there since I was pretty sure that is actually the campground dump station. It is beautiful there, and probably one of the more isolated spots of that area. I saw a lot of great birds, especially bald eagles. It would be a great place to hunt and dry camp in the fall. It also appears to be used for boy scout groups to camp. However, those "necks" of that part of Maryland are incredibly tick infested. I looked at a blade a grass and got a tick on me. For the sake of the Chesapeake Bay, I hope the Army either installs a dump station or bans long term use. J.B. left this review using the Directory software: James Brewster - Revisited on 5 December, without our RV, and found no change from my review of the campground in December 2007. The only change is the gate construction reported in directions to the campground. 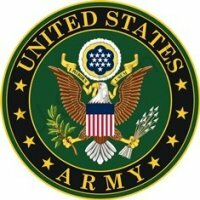 J.B. left this review using the Directory software: Aberdeen Proving Ground is comprised of two principal areas separated by the Bush River. The northern area is known as the Aberdeen Area, and the southern area known as the Edgewood Area - formerly named Edgewood Arsenal. The two areas were administratively combined in 1971. The APG campground is actually located at the Edgewood Area about 30 minutes south of the main APG post and facilities (PX, commissary, medical care, recreation center, library, etc). There is no route crossing the Bush River; therefore, travel between the two areas in on streets and roads off the installations. We did not use the campground during our Christmas Season visit with our son who resides in on-post housing near the campground; however, I walked to the campground to check it out for a planned return visit with our travel trailer next summer. This is a primitive campground located along the Bush River near unoccupied family quarters. The campground was virtually abandoned except for two travel trailers parked on designated sites even though I was there in December when the campground was closed. The grounds were littered with autumn leaves and fallen branches from the abundant deciduous trees. It was difficult to assess the actual size of the sites because of the debris lying about. 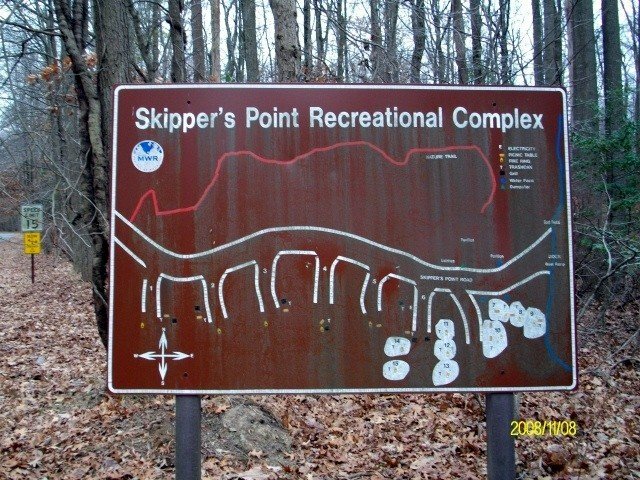 Some observations during my brief visit are: Signage in the campground, at waters edge, list two contact phone numbers (671-4732 and 278-4124). There appeared to be no instructions for self-registration, procedures for check-in and registration were not given, no rules or length of stay posted. The grounds and sites appeared minimally maintained. There are about 6 designated RV camping spaces that appeared to be dry camping, one of which was occupied during my visit. There appeared to be one additional space, perhaps with electricity nearer water. The space was occupied at time of visit but I didnâ€™t see people or vehicles anywhere in the campground. There is a designated tent area nearer the shore and separate from RV spaces. Trees nicely shade the camping area. There is a covered picnic shelter (pavilion) in the campground. No identified playground for children. No identified area for dumping holding tanks. No identified area for obtaining fresh water. No modern toileting, shower, laundry in campground area. There was one freestanding portable chemical toilet (like one can find on a construction site) near the dry camping area. A mini-mart with gas pumps, class six, groceries, pizza is about one-half mile drive away. There is also a chapel, golf coarse, and larger pavilion at the Edgewood Area. Rating: I give this campground two stars with reservation. It would serve nicely as a base camp for visiting the many attractions in the area. It appears the campground may offer opportunity for water sports and family camping. However, it is located a distance from main support facilities, is initially difficult to locate, and may present some obstacles for registration and check-in.